I awoke early and glanced out to the street to see that it was raining quite hard. I had overslept and missed my opportunity to make the early morning visit to St. Peter's (I kicked myself for not having purchased the nifty traveler's alarm that was on sale for about $10 at Brookstone at the Philly airport). When we had viewed the weather channel's web site for the weather in Rome it predicted rain for everyday that we were there, so far it hadn't rained but today it would never let up (something those living there say is rare). We set out after some pastry and expresso for me toward the bus stop in front of Vatican radio. We caught the express and got off around where we thought the Pantheon was, but it turned out we were closer to Piazza Navona. Then we started making our way through the streets toward the Pantheon walking as close to the edge of the buildings as we could to avoid getting wet. Joseph had worn his Star War's shoes and had managed to get his socks wet and was complaining rather loudly about this fact--so began another penitential day in Rome. Sant 'Eustachio offered the first respit from the heavenly deluge, but only briefly. Next it was to the Pantheon which is actually Santa Maria ad Martyres. 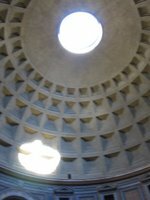 Now I had seen this in works of art in many museum, usually with a beam of sun coming from the hole in the center of the dome (today it was a sheet of rain coming in)...the marvel of this structure is that it is huge and ancient. It is hard to imagine the mixing of cemement and transporting it to the heights necessary for the dome to be constructed. And it still stands in tact! Originally a temple dedicated to all the gods, later it was consecrated as a Church, first to the Holy Spirit (one can imagine the opening as an invitation for the Spirit to rain down the fire of God's love...someone told us that on Pentecost each year rose petals are dropped from the opening to shower down into the Church like tongues of fire) and then later to Our Lady and the many martyrs--those witnesses who point to the reality of the one true God. The major feasts for the Church then are Pentecost and All Saints Day. The great artist Raphael is buried here, along with several Italian monarchs. 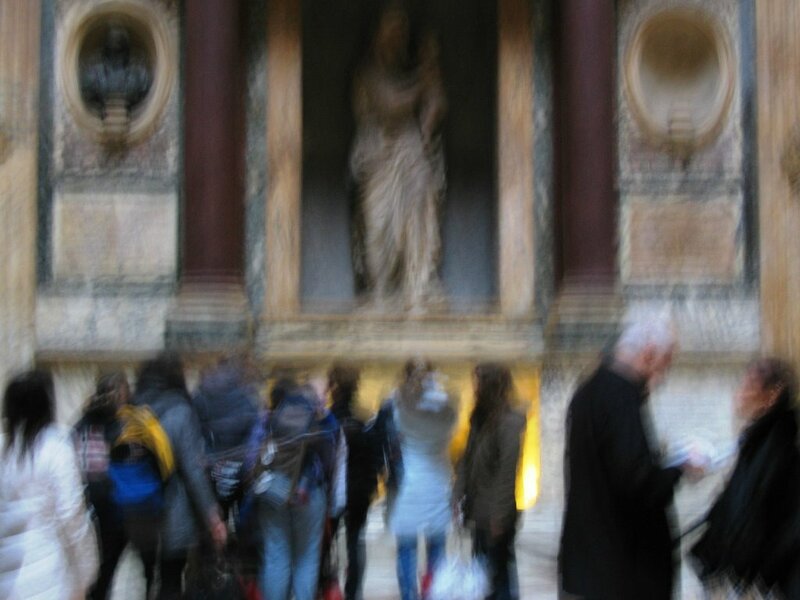 The blury picture to the left is of Amy and Katie standing looking at the tomb of Raphael--not sure why it's so blury or why it is the only picture I took (I was using a digital camera that had 1mb of memory and could have taken 1600 photos). A short walk from the Pantheon was one of the highlights of the day, especially for Katie whose patron saint is Saint Catherine of Sienna--Santa Maria sopra Minerva a Gothic church that we spent a long time in, probably because it felt normal to us, among other things. Saint Catherine's body lies under the main altar covered in white plaster (I read somewhere that until recently this plaster was painted). We all took turns praying at the tomb of Saint Catherine, lit candles and then proceeded to tour the many side altars and other treasures of this beautiful church. Each of these side altars was richly decorated with great art. To the left of the main altar is the tomb of Blessed Fra Angelico, here is the baby Michael paying his respects: If I remember correctly this area from Fra Angelico's tomb to the Sacristy to the left were all sponsored by patrons whose last name was Fragapane, the same family name of one of my good friends who live in another Rome--Rome, NY. I took a picture of this also but it is so blurry that you can't make it out. While looking through the grate of the sacristy, an Italian Dominican nun came through and offered to take us to the room where Catherine of Sienna died. 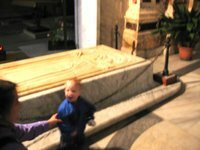 I rushed over to get Katie who was sketching the tomb in the main church and the five of us went on this very special personal tour by the nun who spoke no English but communicated with hand gestures. There were times while I was in Rome that I felt like a Trappist, communicating in some manufactured sign language but getting the message and recieving it okay. The room had been converted into a small chapel, and the nun pointed out the parts that were originale and those that were not (a frequent qualifier on any Roman tour...this is not original). This church also includes a half Michaelanglo sculpture (the other half was finished by his students) of Christ holding his cross. Our next goal was the Gesu, but we didn't find it. Now that I know where it is, I'm not sure why we couldn't find it but on this rainy day reading maps wasn't easy and the winding alleys that are Roman streets all look the same when you're still suffering from jet lag. 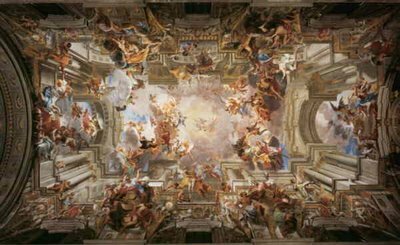 What I did find, was a building that I thought was a church undergoing renovation, what it was in fact was the Galleria Doria Pamphilj. I only got a peak inside, but if you go to their web site you see what I got a glimpse of before Amy beckoned. What you probably can't make out in this image is at the center St. Ignatius is having a vision of the cross and then spilling out to the corners are missionaries being sent to America, Africa, Asia and Europe. Further into the Church is what I took to be a fascinating dome, but it turns out to be nothing but an illusionistic ceiling painting of a dome. Something that you learn both at this church and at the Gesu is that the Jesuits are pretty good at debunking that what you see is worthy of belief. Saint Aloysius Gonzaga is buried here, and we said prayers at his tomb. I inquired about visiting his rooms but instead of seeing them our visit to the Saint Ignatius came to an abrupt ending and we were kicked out. It wasn't anything I said but rather it was 12:30 and the Church closed, again this was mostly communicated by a porter who motioned us and a few others t follow him down a number of hallways and eventually deposited us onto the Piazza di Sant' Ignazio. What followed was a windy, cold walk down a street and then waiting at several different bus stops waiting for a bus to take us back to St. Peter's--after much time one came and we packed like sardines into it and when it deposited us--stopped to pick up some delicious pizza that we ate back in the warmth and dryness of the apartment. I will be back for more of your travel notes.